I'm usually a year round powder foundation wearer, but once the colder temperatures hit this winter, my regular mineral foundations just weren't doing the trick anymore. Right around the same time, I was offered the chance to try out a couple products from Batty's Bath, a London, Ontario company I'd seen raved about before and had followed on Instagram for several months previously, and I knew right away I wanted to try out the company's Whipped Cream Foundation*. The Whipped Cream Foundation ($34 CAD for 0.5 oz) is both vegan and gluten free, and, as the name would suggest, has a creamy, moussy consistency. The ingredients are super clean and natural, and the formula is free of common allergens and skin sensitizers. 2) they leave me with clogged/congested pores if I wear them for more than a couple days in a row. Happily, I haven't had either problem with the Batty's Bath foundation! The foundation is very creamy, but at the same time, it has a drier feel on the skin than other cream products I've used. It doesn't quite set to a full powder finish, but once it's applied and blended, skin feels basically dry to the touch and not tacky, greasy, or coated in makeup. This finish also means that - at least in the winter - it isn't a product I absolutely need to set with powder, although I do find that a light dusting helps the foundation wear a few hours longer. The foundation also feels very lightweight on the skin and isn't makeup that I can feel sitting heavily on my face throughout the day. As for the second point, I've been wearing this foundation pretty much exclusively since early January and haven't experienced any skin issues. I don't wear makeup every single day, but there have been weeks when I've worn it five or six consecutive days and I still haven't had any problems with clogged pores or congested skin, something I credit to the foundation's simple and skin-friendly ingredients. 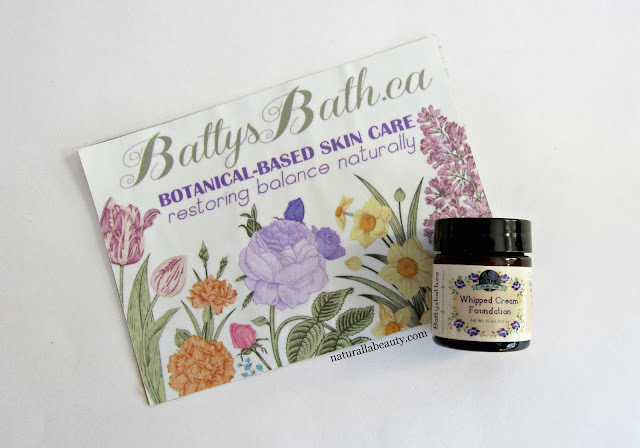 Instead of the coconut oil frequently found in natural cream products, Batty's Bath relies on a base of organic jojoba and apricot kernel oils and organic shea butter. All three rank considerably lower on the comedogenic scale than coconut oil, and are suitable for both sensitive and acne-prone skin types. The formula also includes lavender and rosewood essential oils, great for multiple skin concerns. The essential oils also give the foundation a delicate herbal scent. The remainder of the ingredients list is short and excludes unnecessary bulking agents and fillers. The foundation has a good, solid medium/buildable coverage. A light application evens out skin tone and makes skin look pretty and perfected, but still natural, while fuller coverage can be achieved with a heavier application. The finish is very natural and skin-like. It's not overly dewy or glowy, but it's also not a flat matte on the skin. The foundation also easily doubles as a concealer. My undereyes tend to be pretty dark and most days I'll opt just to use a second thin layer of foundation topped with a brightening powder, rather than adding in a separate cream concealer. Check out the before and after photos! (Click to enlarge.) Relying on natural sunlight in the middle of winter means the lighting changed a little between photos, but hopefully you can still get a good representation of the foundation. The first photo is bare faced, second is with just the Whipped Cream Foundation, and the third is the foundation + a setting powder, blush, brow pencil, and lipstick. I've also posted a couple photos of me wearing the foundation on Instagram this past month. My favorite way to apply this foundation is with my fingers. A little bit goes a long way and fingers help the product spread and sheer out easily for a lighter makeup look -- my preference day-to-day. Because of the foundation's thicker, cream consistency, I find it difficult to get a light application with a brush, but if you're aiming for fuller coverage, a buffing brush and a little more product will easily accomplish that. As with any foundation, well-prepped skin is essential. My skin leans a little dry, and if I haven't moisturized quite enough, the Whipped Cream Foundation can cling to drier patches on my face. Patting over it with a damp sponge usually does the trick when this happens, so it's not been a big deal. 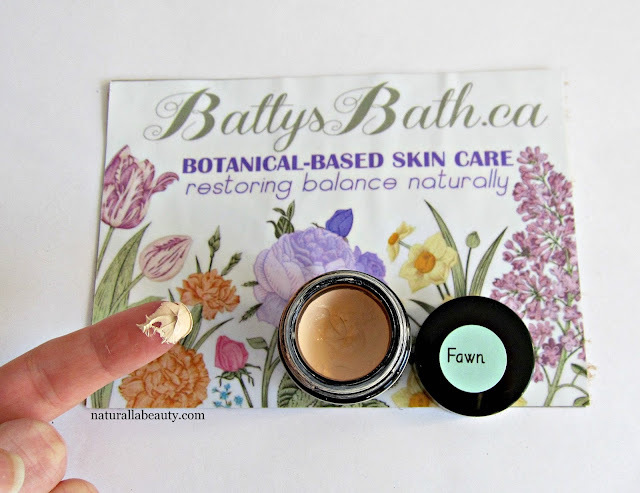 Batty's Bath also suggests mixing the foundation with a small amount of a hydrating product like their Hydra Healing Rescue Gel for dry skin, but that's not something I've experimented with so far. The Whipped Cream Foundation comes in seven shades. I chose Fawn - the second lightest shade in the range - because of its pinker undertones. My skin is very neutral, but happily Fawn isn't super pink - it's more peachy than anything - so it matches my skin very well. The seven shades offer a good range of both cool and warm shades for light and medium skin tones, but I'd love to see Batty's Bath add a couple darker shades in the future as currently there's only one color suitable for deeper skin tones. Definitely a big hit! With wonderful ingredients and great buildable coverage, I think the Whipped Cream Foundation would work well for a lot of people. The foundation never feels slippery or greasy on the skin, and it wears well throughout the day. Despite being a cream formula, my skin has been very okay with it - truly, I don't think my skin has ever been this happy with cream or liquid makeup before - and it's a product I see myself using and enjoying for a long time. 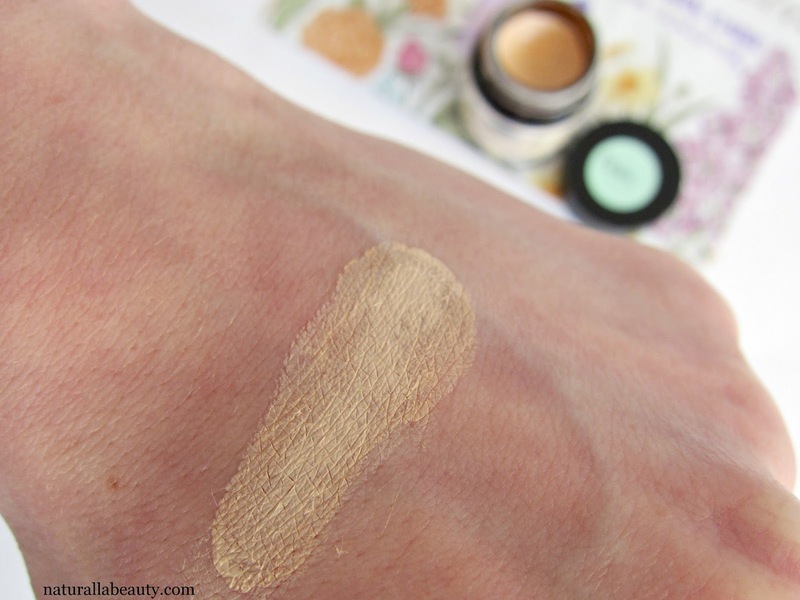 If you're in the market for a new foundation, I highly recommend giving this one a try! This looks and sounds absolutely lovely!! It's hard to find foundations that aren't too heavy. You look lovely!